Yesterday, I came across this list put together by guitarist Jay Ferguson, in which the artist has assembled what he considers as the ten perfect pop songs ever recorded. While I found the list and his accompanying discussions quite fascinating, I also found myself wanting to take issue with his choices, but then I remembered that the whole purpose of lists is to be provocative. Early punk rockers were fond of posting lists (I Like…/I Don’t Like…) for precisely the purpose of being provocative, and they were frequently successful. Since we live in an age of aphorisms (statements of personal taste) rather than one of axioms (universally accepted truths that are potentially falsifiable), it is impossible to post a list consisting of “the ten perfect pop songs” without the list appearing as capricious, nothing but a highly individualized statement of personal taste. So what makes a perfect pop song? Rather than appeal to formal qualities only (melody or hook, for instance), I think the perfect pop song must 1) have achieved some degree of notoriety at inception (it was successful, controversial, provocative, etc. ); and must 2) have transcended the historical moment in which it first appeared. These criteria thus allow for the inclusion of the “one-hit wonder,” many of which have remained remarkably persistent over the years, but also allow for a certain “timeless” quality in the song, in the sense that it has demonstrated an appeal to more than one generation. The real trick is to limit oneself to ten—why? Why pick only ten flavors of jellybeans when you’re in a store with literally dozens of flavors? Thus to limit oneself to ten is really just a parlor game, but that’s fine. I’ll play—but because I’m recalcitrant, I’ll list eleven instead. The following list tries to avoid naming only what I would consider my “personal favorites,” and also tends to avoid naming only rock ‘n’ roll songs. Armstrong’s rough, gravelly voice is instantly recognizable and is known world-wide. Despite the limitations of his voice, he was a great singer, and “What A Wonderful World” has proved its durability by being a hit single several times over several decades—when it was first released in 1968, when it was re-released in the early 1970s following his death, and a hit again when it appeared on the soundtrack to Good Morning, Vietnam (1987). Remember that it was Armstrong’s version of “Hello, Dolly!” in 1964 that knocked the Beatles off the top of the Billboard chart, which they had so long dominated. Frank Sinatra’s album In the Wee Small Hours (1955) is one of pop music’s finest records. Every song on the album is an expression of a different dramatic persona. Sinatra approached a song like an actor approaching a role, seeking to express not himself but a character, with the song being like an inner monologue. There is no singer today who hasn’t been influenced by Sinatra’s use of the microphone; whether he or she is conscious of this fact is irrelevant. I love this song for its dramatic idea and for his phrasing—pop music at its finest. Session players and songwriters Ed Sanford and John Townsend struck gold with this one huge hit, and what a song it is. Again, I love the idea of this song, in the same vein as the Righteous Brothers’ “You've Lost That Lovin’ Feeling,” except it is more raucous and less lugubrious. If one were to make a list of those pop songs ideally suited for Top 40 radio, most certainly this would be one of them. The music made by Elvis during and after his 1968 “comeback” has to be some of the finest music of his career. In this song—and every song on 1969’s From Elvis in Memphis for that matter—his singing was strong, dramatic, and heartfelt. I loved this song when I first heard it forty years ago, and I still do—it is impossible for me to turn off the radio if this song is playing. It features a great arrangement, a strong melody, and of course wonderfully emotive vocals. Former President Bill Clinton named Aretha Franklin “a national treasure,” and songs such as this flawless pop recording indicate why he did so. She of course has many hits and many fine albums, but this song is an ideal demonstration of her voice. Make no mistake: Patsy Cline was a pop singer, not a country singer, and man, could she sing. She recorded many fine songs, but I’ve always liked this one (this, and “Poor Man’s Roses”) the best. The song structure is very economical, to be sure, but the lyrical content is more about loneliness than heartbreak—and that’s what Patsy Cline’s voice could capture so very well—loneliness. Perhaps it’s a “one-hit wonder,” but I think this is very nearly a perfect pop song: a great hook, chiming guitars, a driving rhythm, and a brilliant idea—improbably, a love song to a fallen woman the singer has never met. This is a pop song that is warm, genuine, melodic—and carries the sting of truth. Although by no means a group known primarily as being a one-hit wonder, “Everybody Plays the Fool” became The Main Ingredient’s biggest and best-known hit, and an auspicious beginning to the group’s Cuba Gooding, Sr. period. Gooding’s lead vocal has a humanness to it that the best pop singers have always had. There’s no doubt in my mind that Willie Nelson’s Red Headed Stranger is one of the all-time best pop albums ever made—and no, it ain’t “country.” Willie Nelson is a great songwriter, not a great country songwriter. “Blue Eyes Crying in the Rain” is a sparse, haunting ballad that rests on the painful truth that love is either waxing or waning (in this case the latter), and features only Willie’s distinctive voice and his old, battered, Spanish guitar. Is it possible for a song to break your heart? If it is, this pop song from 1970 does it to me. 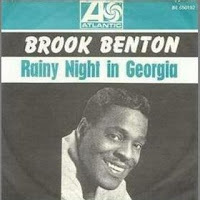 “Rainy Night in Georgia” was written by Tony Joe White, but Brook Benton got the hit from it. Haunting, melancholic, impossible to turn off if it is playing on the radio, “Rainy Night in Georgia” is nothing less than perfect studio production coupled with superb pop songwriting. It is also a perfect realization of the so-called “sympathetic fallacy,” in which nature seemingly reflects one’s inner state of mind (psyche). Nice blog good content I enjoy reading it. Thanks!